According to UNHCR at the beginning of 2017 about 7,000 people are stuck in Serbia. 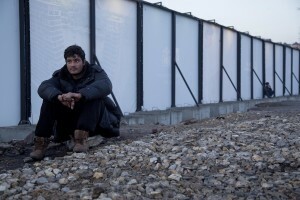 They are migrants mostly coming from Afghanistan and Pakistan, whose 60% are unaccompanied minors. Several hundreds migrants who currently leave in Serbia have found refuge in abandoned warehouses behind Belgrade's train station. 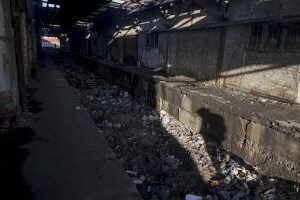 They sleep on the floor and protect themselves from the cold Serbian winter temperatures lighting fires with railway tracks wooden beams, plastic and waste of any kind, making toxic and unbreathable the air. The great part of them prefers continuing living in the old railways station warehouses, rather than moving to official camps for the fear of being expelled by the government. 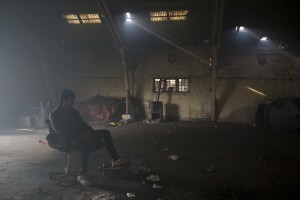 A migrant rests inside an abandoned warehouse where he and other migrants took refuge in Belgrade, Serbia on February 5, 2017. Hundreds of migrants have been sleeping in freezing conditions in central Belgrade looking for ways to cross the heavily guarded EU borders. 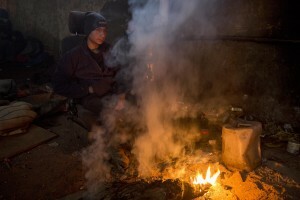 A migrant sits around a fire to warm himself from the cold in an abandoned warehouse in Belgrade, Serbia on February 3, 2017. Hundreds of migrants have been sleeping in freezing conditions in downtown Belgrade looking for ways to cross the heavily guarded EU borders. 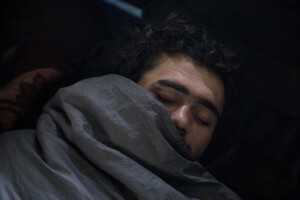 A migrant sleeps on the ground of an abandoned warehouse where he and other migrants took refuge in Belgrade, Serbia on February 5, 2017. Hundreds of migrants have been sleeping in freezing conditions in central Belgrade looking for ways to cross the heavily guarded EU borders. 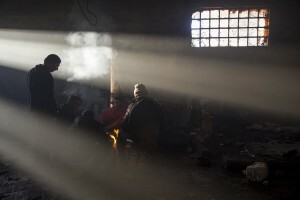 Migrants gather around a fire to warm themselves from the morning cold outside an abandoned warehouse where they are taking refuge, in Belgrade, Serbia on February 3, 2017. Hundreds of migrants have been sleeping in freezing conditions in central Belgrade looking for ways to cross the heavily guarded EU borders. A migrant walks inside an abandoned warehouse where he and other migrants took refuge in Belgrade, Serbia on February 4, 2017. Hundreds of migrants have been sleeping in freezing conditions in central Belgrade looking for ways to cross the heavily guarded EU borders. A refugee washes his face in an abandoned warehouse where he and other migrants took refuge in Belgrade, Serbia on February 5, 2017. Hundreds of migrants have been sleeping in freezing conditions in central Belgrade looking for ways to cross the heavily guarded EU borders. Migrants are seen inside an abandoned warehouse in Belgrade, Serbia on February 3, 2017. Hundreds of migrants have been sleeping in freezing conditions in downtown Belgrade looking for ways to cross the heavily guarded EU borders. Refugees shower outside an abandoned warehouse where they took refuge in Belgrade, Serbia on February 4, 2017. Hundreds of migrants have been sleeping in freezing conditions in central Belgrade looking for ways to cross the heavily guarded EU borders. A migrant rests outside an abandoned warehouse where he and other migrants took refuge in Belgrade, Serbia on February 6, 2017. Hundreds of migrants have been sleeping in freezing conditions in central Belgrade looking for ways to cross the heavily guarded EU borders. Migrants sit eating their lunch outside an abandoned warehouse where they took refuge in Belgrade, Serbia on February 3, 2017. Hundreds of migrants have been sleeping in freezing conditions in central Belgrade looking for ways to cross the heavily guarded EU borders. Migrants rest inside an abandoned warehouse in Belgrade, Serbia on February 3, 2017. Hundreds of migrants have been sleeping in freezing conditions in downtown Belgrade looking for ways to cross the heavily guarded EU borders. 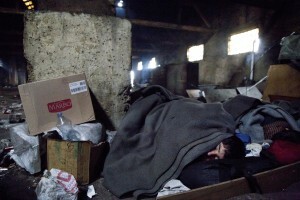 A migrant sleeps on the ground of an abandoned warehouse where he and other migrants took refuge in Belgrade, Serbia on February 4, 2017. Hundreds of migrants have been sleeping in freezing conditions in central Belgrade looking for ways to cross the heavily guarded EU borders. A refugee washes his foot outside an abandoned warehouse where he and other migrants took refuge in Belgrade, Serbia on February 5, 2017. Hundreds of migrants have been sleeping in freezing conditions in central Belgrade looking for ways to cross the heavily guarded EU borders. 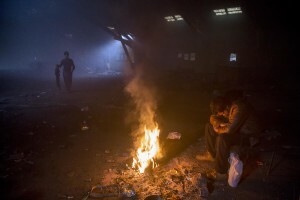 A migrant rests around a fire to warm himself from the cold in an abandoned warehouse in Belgrade, Serbia on February 3, 2017. Hundreds of migrants have been sleeping in freezing conditions in downtown Belgrade looking for ways to cross the heavily guarded EU borders. Migrants are seen inside an abandoned warehouse in Belgrade, Serbia on February 5, 2017. Hundreds of migrants have been sleeping in freezing conditions in downtown Belgrade looking for ways to cross the heavily guarded EU borders. A migrant rests on the ground of an abandoned warehouse in Belgrade, Serbia on February 6, 2017. Hundreds of migrants have been sleeping in freezing conditions in downtown Belgrade looking for ways to cross the heavily guarded EU borders. 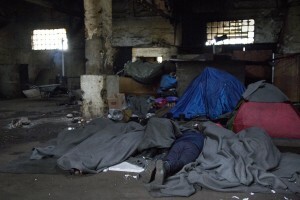 Migrants sleep on the ground of an abandoned warehouse where they took refuge in Belgrade, Serbia on February 4, 2017. Hundreds of migrants have been sleeping rough in freezing conditions in central Belgrade looking for ways to cross the heavily guarded EU borders. A migrant warms up around a fire in an abandoned warehouse in Belgrade, Serbia on February 4, 2017. Hundreds of migrants have been sleeping in freezing conditions in downtown Belgrade looking for ways to cross the heavily guarded EU borders. Migrants outside an abandoned warehouse where they are taking refuge, in Belgrade, Serbia on February 3, 2017. Hundreds of migrants have been sleeping in freezing conditions in central Belgrade looking for ways to cross the heavily guarded EU borders. 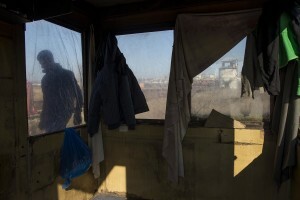 A migrant is seen through the window of a cabin built outside an abandoned warehouse where he and other migrants took refuge in Belgrade, Serbia on February 5, 2017. Hundreds of migrants have been sleeping in freezing conditions in central Belgrade looking for ways to cross the heavily guarded EU borders. Refugees shower outside an abandoned warehouse where they took refuge in Belgrade, Serbia on February 3, 2017. Hundreds of migrants have been sleeping in freezing conditions in central Belgrade looking for ways to cross the heavily guarded EU borders. A migrant wearing a shirt in an abandoned warehouse in Belgrade, Serbia on February 3, 2017. Hundreds of migrants have been sleeping in freezing conditions in downtown Belgrade looking for ways to cross the heavily guarded EU borders. Migrants rest around a fire to warm theirselves from the cold in an abandoned warehouse in Belgrade, Serbia on February 4, 2017. Hundreds of migrants have been sleeping in freezing conditions in downtown Belgrade looking for ways to cross the heavily guarded EU borders. Migrants sit drinking a tea inside an abandoned warehouse where they took refuge in Belgrade, Serbia on February 4, 2017. Hundreds of migrants have been sleeping in freezing conditions in central Belgrade looking for ways to cross the heavily guarded EU borders. A migrant rests on a chair inside an abandoned warehouse in Belgrade, Serbia on February 3, 2017. Hundreds of migrants have been sleeping in freezing conditions in downtown Belgrade looking for ways to cross the heavily guarded EU borders. Migrants enter in a tent inside an abandoned warehouse in Belgrade, Serbia on February 3, 2017. Hundreds of migrants have been sleeping in freezing conditions in downtown Belgrade looking for ways to cross the heavily guarded EU borders. 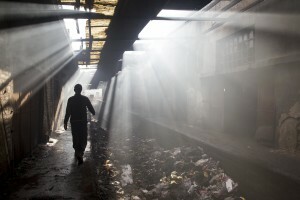 A shadow shows a migrant walking inside an abandoned warehouse in Belgrade, Serbia on February 5, 2017. Hundreds of migrants have been sleeping in freezing conditions in downtown Belgrade looking for ways to cross the heavily guarded EU borders. Migrants prepare for shower outside an abandoned warehouse where they took refuge in Belgrade, Serbia on February 3, 2017. Hundreds of migrants have been sleeping in freezing conditions in central Belgrade looking for ways to cross the heavily guarded EU borders. 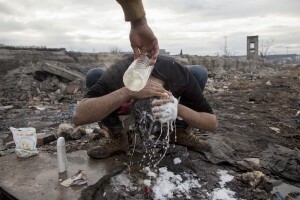 A refugee washes his hair outside an abandoned warehouse where they took refuge in Belgrade, Serbia on February 3, 2017. Hundreds of migrants have been sleeping in freezing conditions in central Belgrade looking for ways to cross the heavily guarded EU borders. A migrant hangs laundry outside an abandoned warehouse where they are taking refuge, in Belgrade, Serbia on February 3, 2017. Hundreds of migrants have been sleeping in freezing conditions in central Belgrade looking for ways to cross the heavily guarded EU borders. Migrants rest outside an abandoned warehouse where he and other migrants took refuge in Belgrade, Serbia on February 4, 2017. Hundreds of migrants have been sleeping in freezing conditions in central Belgrade looking for ways to cross the heavily guarded EU borders. A migrant sleeps on the ground of an abandoned warehouse where he and other migrants took refuge in Belgrade, Serbia on February 3, 2017. Hundreds of migrants have been sleeping in freezing conditions in central Belgrade looking for ways to cross the heavily guarded EU borders. A map of Europe is attached on the wall of an abandoned warehouse in Belgrade, Serbia on February 5, 2017. Hundreds of migrants have been sleeping in freezing conditions in downtown Belgrade looking for ways to cross the heavily guarded EU borders. A migrant is seen inside an abandoned warehouse in Belgrade, Serbia on February 6, 2017. Hundreds of migrants have been sleeping in freezing conditions in downtown Belgrade looking for ways to cross the heavily guarded EU borders. 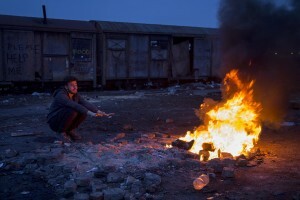 A migrant sits around a fire to warm himself from the cold outside an abandoned warehouse in Belgrade, Serbia on February 3, 2017. Hundreds of migrants have been sleeping in freezing conditions in downtown Belgrade looking for ways to cross the heavily guarded EU borders. 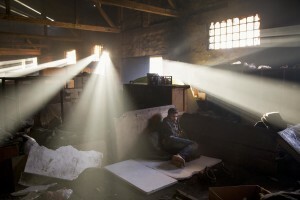 A migrant prays in an abandoned warehouse where he and other migrants took refuge in Belgrade, Serbia on February 4, 2017. Hundreds of migrants have been sleeping in freezing conditions in central Belgrade looking for ways to cross the heavily guarded EU borders. Migrants leave the abandoned warehouse where they stayed for several months to reach the border with Hungary and groped to cross it in Belgrade, Serbia on February 3, 2017. Hundreds of migrants have been sleeping in freezing conditions in downtown Belgrade looking for ways to cross the heavily guarded EU borders.